This handsome stag horn handled carving set adds the perfect complement to your lodge, rustic or Southwestern kitchen decor. The set includes a large stainless steel roasting fork and carving knife, each with authentic antler handles capped with brass ends. Stamped on the knife’s blade is "Royal Brand Cutlery Company, Stainless Steel, Sheffield England." DIMENSIONS: Knife is 14.5” long and fork is 10.5” long. Very good condition; normal wear from usage, minor rust spots on fork. 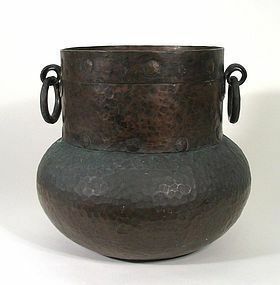 DESCRIPTION: A superb solid copper Spanish Colonial cooking pot with a wide banded straight neck and hand hammered bulbous body. 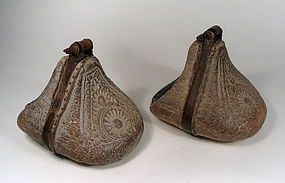 Large handmade brads hold the thick copper sheets in place, and two sturdy rings hang from downward curling supports. PROVENANCE: Sourced in Chile while on a South American buying trip; early to mid 1800's. This is a magnificent, solid pot in excellent original condition with age appropriate wear and patina. DIMENSIONS: 11" high (28 cm) x 12" diameter (30.5 cm).